This month sees the inaugural Slow Fashion October, a great idea from Karen at the Fringe Association blog. She is encouraging us to think more about where our clothing comes from, and how this impacts on the environment. If you have a look at her blog you will see there are suggested topics for each week, including (my favourite) talking about ‘loved’ and ‘worn’ clothing. This week she is encouraging conversations about ‘small’, which includes capsule wardrobes and living with less. As October also sees the latest installment of my attempt at Project 333 I thought I would add some thoughts. 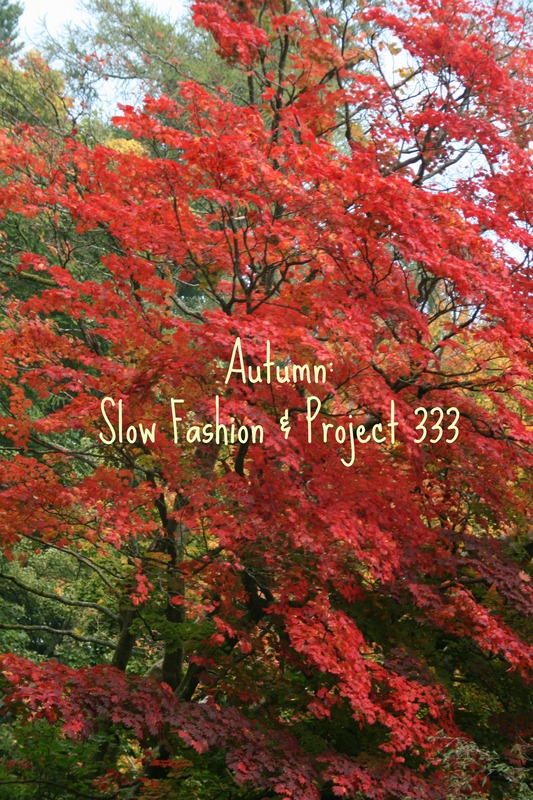 Project 333 is a capsule wardrobe concept that I have been following for the past year. I can’t believe that it’s been 12 months since I first embarked on wearing a simplified wardrobe: just 33 items of clothing, incl shoes and coats, for three months. There have been times when I have felt frustrated by the limited closet I have found myself with, and have questioned whether it fits with my own style. But I have also relished the opportunity to get dressed quicker and easier because everything I choose for the season has to match. I have also enjoyed putting some items away for a while and then rediscovering them at a later date. Now the seasons have turned again and I am putting together my Autumn/Winter wardrobe. I have, once again, emptied my wardrobe and been brutally honest about some of the items. There are a couple of dresses that are now too ‘snug’ and so they have been sent to the charity shop, along with a jumper that was no longer working for me. Other items have been put away and I realise that I am now left with a few gaps. For the first time I’ve also included accessories (scarves, hat, bracelet and belt). I really enjoyed just having one simple piece of jewellery to wear last season and I shall be on the lookout for a junk shop necklace to wear for this season. I’m also ditching my calf length brown boots and will be hunting for some black ankle boots from local charity shops. There are also a couple of long sleeved tops that I want to replace and perhaps a new (to me) skirt. Knowing that I have some gaps in my wardrobe makes clothes shopping so much easier. I take a list with me and browse the second-hand shops. Over at mymakedoandmendlife blog Jen is trying to go without buying any clothes for a year. There are some useful links and tips on how to better care for the clothes that you have which I am going to really try to follow, although I couldn’t give up buying outfits for 12 months – even when they are always second-hand!